Victoria, British Columbia, Canada 2016. You simply MUST go! The city is magnificent. The people are super nice. The weather is gorgeous. The food is delicious. The flowers are everywhere. I could go on and on. Victoria was one of the best city visits I've ever experienced. God has blessed me to travel to 45 states including Alaska and Hawaii and seven different countries. This lady has been standing on this corner at various times for the past seven years giving free hugs. Sloane spotted her first and said "Let's get a free hug!". I was apprehensive. I can hug. I like to hug but it's not a common practice for me with total strangers. Also, short in stature does not a good hugger make. You can get a little more insight into short hugger thoughts here. Since I'm always willing to experience something new and different, I hugged her. She may be the reason my trip to Victoria was so overwhelming? Her hug was the sweetest, most exhilarating, non-invasive hug ever! She cooed to me in a bird-like song as our arms met and embraced thanking me for stopping to hug her telling me "You're such a good hugger" and "Bless you". 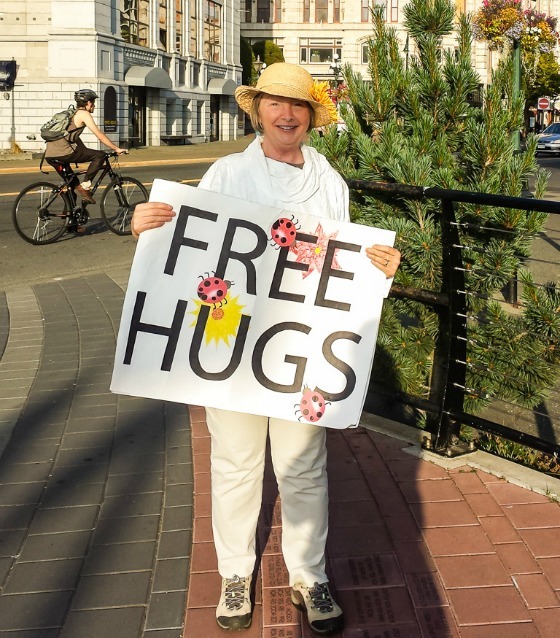 Uh, no, Free Hug Lady, thank you! The experience of that hug still lingers in my heart. Yesterday, God used that experience in a way I didn't see coming. Steve and I were at Emory for his checkup. A young woman in a wheelchair with oxygen was leaving the office when the doctor came out and whispered something to her. A few minutes later, I saw this same lady wiping tears from her face as she and her male companion waited for the elevator. I wondered if the doctor had told her bad news about her health. In the same instance, Godly compassion filled my heart and I began to pray for her lifting her needs to our Heavenly Father. Can you guess what happened next? That's right. God nudged me to hug her. I gave him all the reasons why I couldn't. She's a stranger. She's black. She don't want no white girl getting in her face. There's eight people waiting in this tiny area for an elevator! My heart started POUNDING! Just as her friend was moving her toward the elevator, I did it! I asked if I could hug her, she nodded and I did it. It wasn't awkward or strange in any way. It felt good to extend the love of the Father to a fellow being. I saw her again in the lab. She looked at me and smiled. Her entire countenance had changed. She seemed more peaceful, more content. You may hug strangers all the time, but I usually don't. 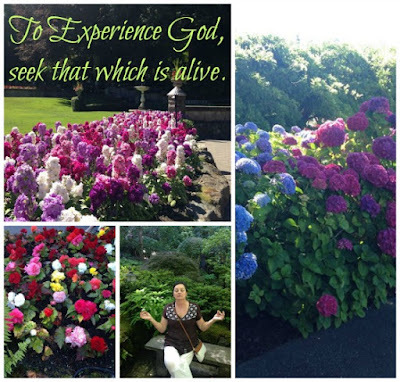 God showed me that to experience him, you must seek that which is alive. I loved the beautiful scenery in Victoria. The flowers are alive now but will soon die. People are alive now but will soon die but their souls are alive forever. I Corinthians 15:22 For as in Adam all die, even so in Christ shall all be made alive. God's love is alive! Share the love whenever and wherever you get the opportunity... especially to strangers. Feel free to leave a comment with hugging tips or experiences. Several years ago I heard a radio message about how easy it is to miss the last opportunity to tell someone you love them. That missed opportunity may haunt you later when that chance is gone. It spoke to me to tell people I love that I love them. At first it felt awkward to tell my father in law or extended family I loved them. But eventually it became easier and more comfortable and now I often express my care with an I love you or a hug. When they are gone, I can remember they knew I loved them because I told them. People need each other.